Dewayne Johnson, a 46-year-old former groundskeeper, won a huge victory in the landmark case on Friday, with the jury determining that Monsanto’s Roundup weedkiller caused his cancer and that the corporation failed to warn him of the health hazards from exposure. The jury further found that Monsanto “acted with malice or oppression”…Johnson’s case was particularly significant because a judge allowed his team to present scientific arguments. The dispute centered on glyphosate, which is the world’s most widely used herbicide…During the lengthy trial, the plaintiff’s attorneys brought forward internal emails from Monsanto executives that they said demonstrated how the corporation repeatedly ignored experts’ warnings, sought favorable scientific analyses and helped to “ghostwrite” research that encouraged continued usage. Following the classification of glyphosate in March 2015 as probably carcinogenic to humans (Group 2A) by the IARC Monographs Programme, IARC has been the target of an unprecedented number of orchestrated actions by stakeholders seeking to undermine its credibility. In the interest of transparency, IARC has documented some of these instances, and our responses can be found on the Agency′s Governance website. Glyphosate is used in incomprehensibly huge amounts. The organic advocate, Charles Benbrook, published statistics on its use in 2016. Monsanto’s published a rebuttal to Benbrook’s paper, but did not dispute his figures; instead, it argued only glyphosate is safe. Benbrook’s data show that 250 million pounds of glyphosate were applied to US crops in 2014 (by another source, worldwide use was 825,804,000 kilograms, or more than 1.8 billion pounds that year). Through discovery during the trial, documents came to light exposing Monsanto’s efforts to discredit the science linking glyphosate to cancer. U.S. Right to Know (USRTK) has performed an extraordinary public service by posting the key documents in the case on its website. There, you can find links to an astonishing number of federal court and discovery documents, exhibits, news reports, and commentary. Monsanto was its own ghostwriter for some safety reviews,” Bloomberg reported, and an EPA official reportedly helped Monsanto “kill” another agency’s cancer study. An investigation in Le Monde details Monsanto’s effort “to destroy the United Nations’ cancer agency by any means possible” to save glyphosate. Monsanto and its chemical industry allies have spent decades actively working to confuse and deceive consumers, farmers, regulators and lawmakers about the risks associated with glyphosate-based herbicides. As they’ve suppressed the risks, they’ve trumpeted the rewards and pushed use of this weed killer to historically high levels. The evidence that has come to light from Monsanto’s own internal documents, combined with data and documents from regulatory agencies, could not be more clear: It is time for public officials across the globe to act to protect public health and not corporate profits. Monsanto will appeal, of course; its owner, Bayer, continues to insist that glyphosate is safe. Press accounts say that hundreds, if not thousands, of more such cases are in the pipeline, a situation similar to that faced by the tobacco industry before that industry gave up and settled. Will Bayer do so as well? I’m guessing not without a fight. Carey Gilliam. 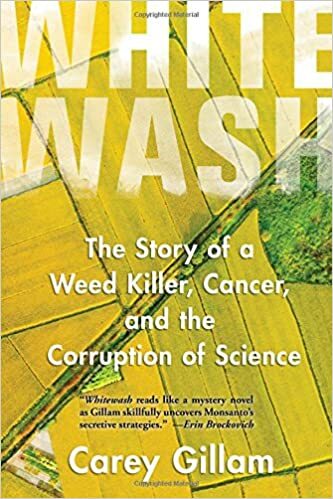 Whitewash: The Story of a Weed Killer, Cancer, and the Corruption of Science. Island Press, 2017. Whitewash, says Carey Gilliam, is what Monsanto, Monsanto-paid scientists, and the Monsanto-influenced EPA are trying to do for the herbicide glyphosate (“Roundup”)—make it appear benign in the face of evidence that glyphosate may be carcinogenic, strongly promotes weed resistance, and causes genetically modified crops to require even greater use of toxic chemicals. Gilliam’s deep dive into this industry’s manipulation of science gives us even more reasons to advocate for organic and sustainable agricultural systems. Does Monsanto collude with EPA to cast doubt on the carcinogenicity of Roundup? Yesterday’s New York Times reports about how the agricultural biotechnology company Monsanto is trying to cast doubt on evidence that its herbicide Roundup (glyphosate) is carcinogenic or otherwise harmful to human health. The Times based its analysis on documents unsealed by a federal court in a case in which people are claiming that glyphosate caused them to develop non-Hodgkin’s lymphoma, which the International Agency for Research on Cancer (IARC) determined a couple of years ago. The documents confirm previous disclosures of Monsanto’s attempts to manipulate academic research. The Times article does not link to the actual documents, but these are posted on the Website of US Right to Know. Monsanto has made it clear throughout this litigation that it intends to rely on EPA’s conclusions in the defense of this case, particularly in this first phase of general causation. Based on these documents alone, it is clear that Monsanto enjoyed considerable influence within the EPA’s OPP, and was close with Mr. Rowland, who promised to try to “kill” the glyphosate issue for them; coincidentally, a report authored chiefly by him was “accidentally leaked” just at the time of his planned retirement. Addition: The New York Times reports that a European Chemical agency says Roundup is not carcinogenic. A week or so ago I mentioned Monsanto’s concerns about its public image problem and its new PR campaign. In Washington, DC last week, I saw what seem to be its first components in a hard copy of Politico (the online version doesn’t seem to carry the same ads). What farmers? Those that use Monsanto products, of course. This is not the first time Monsanto has used ads promoting the virtues of farmers. 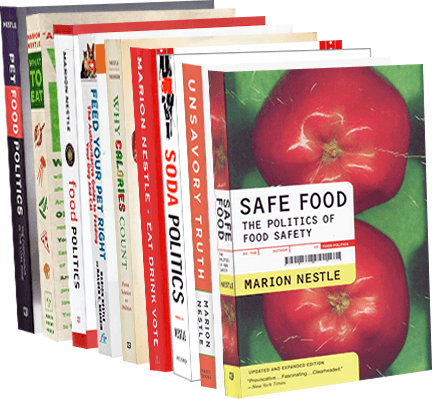 Here’s one from a Monsanto campaign in 2001 that I used as an illustration in Safe Food: The Politics of Food Safety. Will ads like these help improve Monsanto’s public image? You tell me. Monsanto has a public image problem? A surprise? Thanks to Politico for alerting us to Monsanto’s sudden discovery: it has just recognized—can you believe this?—that it has a public image problem. In recent months the company has shaken up its senior public relations staff, upped its relationship with one of the nation’s largest public relations firms and helped launch a website designed to combat the fallacies surrounding genetically modified organisms. Efforts to protect our intellectual property rights and to defend claims against us can increase our costs and will not always succeed; any failures could adversely affect sales and profitability or restrict our ability to do business. Intellectual property rights are crucial to our business, particularly our Seeds and Genomics segment. We endeavor to obtain and protect our intellectual property rights in jurisdictions in which our products are produced or used and in jurisdictions into which our products are imported. Regulatory and legislative requirements affect the development, manufacture and distribution of our products, including the testing and planting of seeds containing our biotechnology traits and the import of crops grown from those seeds, and non-compliance can harm our sales and profitability. The degree of public acceptance or perceived public acceptance of our biotechnology products can affect our sales and results of operations by affecting planting approvals, regulatory requirements and customer purchase decisions. Some opponents of our technology actively raise public concern about the potential for adverse effects of our products on human or animal health, other plants and the environment. .. Public concern can affect the timing of, and whether we are able to obtain, government approvals. Even after approvals are granted, public concern may lead to increased regulation or legislation or litigation…which could affect our sales and results of operations by affecting planting approvals, and may adversely affect sales of our products to farmers, due to their concerns about available markets for the sale of crops or other products derived from biotechnology. Maybe if the company was less aggressive about defending itself against risks #1 and #2, public relations would be less of an issue. Do the close calls on labeling initiatives in California and Washington worry Monsanto? Of course they do. They should. I was on the FDA food advisory committee in 1994 and witnessed Monsanto’s aggressive opposition to labeling. If public image is a problem for the company, it has nobody to blame but itself. The only surprise: Why did public demands for labeling take so long?